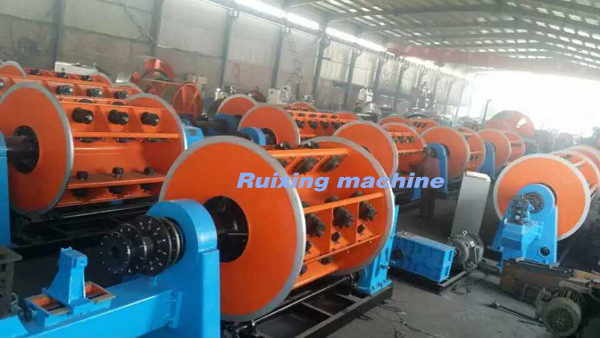 The machine is used for manufacturing wire without back twisting such as copper strand, aluminum strand, ACSR as well as twisting insulated wire or strand. If equipped with a pressing device, it is used for stranding sector conductor, round conductor and compacted & pre-spiraled separated conductor. 1. The bobbins in the cages can be loaded and unloaded individually or integrally, and in the latter case, three options are offered: bottom- loading, top-loading and side- loading. 2. The bobbins in the cage are clamped pneumatically or by hands. In the latter case, the bobbins are clamped by turning the worm gears or hand wheels. Mechanical safe locking is provided for each system. 3. The payoff tension is controlled by mechanical friction or by air force. For the air force tension, the payoff tension is kept constant from full to shallow bobbin under the electric control system. 4. Three methods of wire-breaking test for choice: mechanical, electrical or both of them. 5. The twisting cage has a whole shaft without any eccentricity. Wire per-forming units are provided for each cage for twisting the conductors properly and the stranded wires will not loose in case of cutting at any point. 6. For the electric system, the PLC and touch screen may be provided at the user's request to control the whole line. The technical data may be set, modified and displayed on the touch screen. The DC motors are controlled by new digital DC drivers. The electric system is advanced and reliable. Pay-off strand, stranding cartage, compact die stand, double draught wheels, take up and traverse device, mechanical transmission system and electrical control system. Group loading and unloading spools devices, compact & pre-spiral device and taping head.